Lysenko graduated from the Uman School of Horticulture in 1921 and was then appointed to a position at the Belaya Tserkov Selection Station. After his 1925 graduation from the Kiev Agricultural Institute, with the degree of doctor of agricultural science, he was stationed at the Gyandzha Experimental Station. From 1929 to 1934 he held the office of senior specialist in the department of physiology of the Ukrainian All-Union Institute of Selection and Genetics in Odessa; from 1935 to 1938 he was scientific director and then director of that institution. In 1938 he became president of the Academy of Agricultural Sciences. Lysenko began his career by promoting ideas derived from the work of the horticulturist I.V. Michurin, a practical man without scientific training who was successful in creating hybrids in fruit trees. Michurin and Lysenko rejected the scientific concept of genetics developed by Mendel and returned in essence to the ideas of Lamarck that traits acquired during the lifetime of plants can be inherited by their offspring. Based on crude and often undocumented experiments Lysenko developed his own doctrine that new plants can be produced by exposing traditional plants to the right conditions. He claimed, for example, that wheat plants raised in the appropriate environment produce seeds of rye. Lysenko was an expert in exploiting the political situation under Stalin, and as a consequence his unscientific ideas caused much damage to the development of Soviet agriculture and biological science. 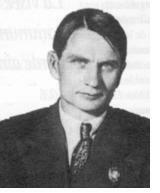 Under Stalin Lysenko became director of the Institute of Genetics of the Academy of Sciences of the U.S.S.R. and controlled Soviet biology to the extent that the leading international plant geographer, eminent plant geneticist and ardent advocate of the unity of science and socialism Nikolay Vavilov was removed from his position as director of the Institute of Genetics and imprisoned after a show trial. Vavilov died in prison in 1943. After Stalin's death Lysenko was criticized and relieved of his post as president of the Academy of Agricultural Sciences in 1954 but retained a position as personal adviser to the government on agriculture. He was not deposed as director of the Institute of Genetics until 1965 and was never taken to account for the damage he inflicted on the development of Soviet agriculture.